"More than 3,000 people lost their homes in last week's mudslide in Sierra Leone, which killed at least 499 people, with more than 600 still missing. "It is difficult to know the precise number of victims," says volunteer body collector Fessellie Marah, "because so many bodies were broken apart. We are still finding body parts in the rubble". 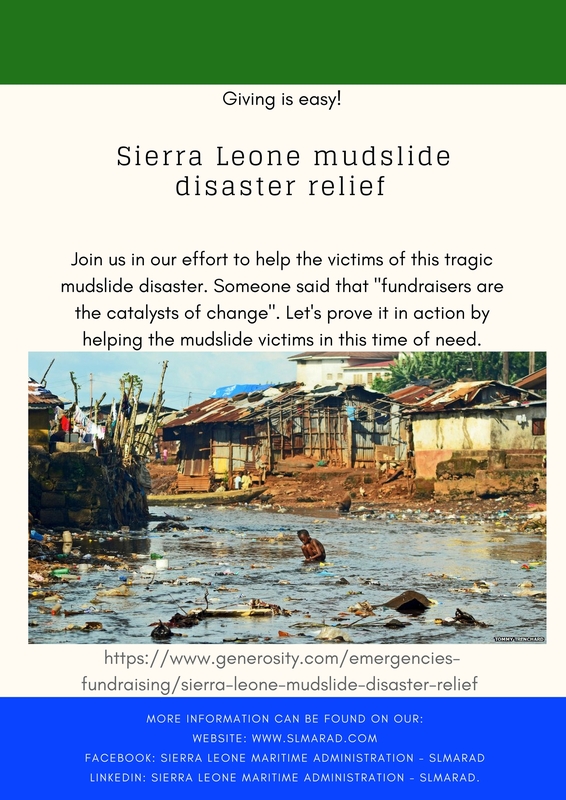 SLMARAD (Sierra Leone Maritime Administration's International Office) in an effort to support the Government of Sierra Leone is organizing this fundraise in order to assist the victims of this tragic event to revive in the best way possible. Someone said that fundraisers are the catalysts of change. Let's prove it in action by helping the mudslide victims in this time of need.